It seems that Barak Obama has let the cat out of the bag concerning one thing he plans on doing if elected. He's going to add 7 new states! Obama, speaking at the start of a two-day swoop through Oregon, let it slip that during this marathon 16-month Democratic presidential nomination struggle, he had already visited 57 states with one more to go. That's not counting Alaska and Hawaii, he said, which his staff decided aren't important enough to visit yet. Has this aging freshman senator -- he'll be almost 60 in 13 years -- lost his bearings? I'm guessing he meant that he has made 57 trips to different states, some more than once, some not at all. That makes sense, except that I'd think he would have made more trips than that. Regardless, it's a silly slip up and people are having a lot of fun at his expense. 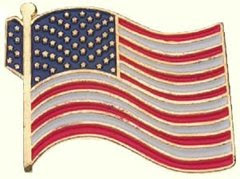 In fact another blog, something called Suitably Flip, has created a special 57 state lapel pin. Hilarious. Anyone have any thoughts on the new states to be added? The first that comes to mind results from the splitting of Florida into North Florida and South Florida. Post your suggestions for the rest in the comments. Northern and Southern California would be an obvious split, as they are in many ways two different places. People would constantly be confusing North California with North Carolina, unless they kept the -ern ending. But California will never split itself in two because together we're the big enchilada of the electoral college. But I think it would never do that for the same reason CA would never do it. In fact, I'm sure some states would try to combine forces with other states if they possibly could. Let's have some fun with this, though. So we have Northern California, SoCal, East Texas and West Texas. Now I'm sure that the Michiganders in the Upper Peninsula are an ethnically and economically distinct group, probably with their own ancient customs and the like, and are deserving of self-governance. So I think splitting the state into North Michigan and South Michigan is appropriate. That leaves us at 56. Sylvania and the Penn Republic. There has been some talk here recently on Long Island about turning it into a seperate state from New York. I was wondering about how New York would be partitioned. I assumed it would be into two -- NYC vs. Upstate. But perhaps there are three. I've been to Long Island, and it does seem like another world, sometimes! And Jenn, I specifically avoided mentioning Canada, but I must admit to getting a chuckle out of your comment. Kyle, which part is to be Sylvania and which the Penn Republic? Is the split to be on ethnic, religious or geographical lines?